According to my grandfather, you should eat blueberries every morning for breakfast. Grandpa is never wrong 🙂 Thankfully, he provided us all with this great opportunity by taking my family blueberry picking last summer. We were still in Germany during that time (strawberry picking, as it were). But, there is now a freezer full of hand-picked blueberries. I am definitely enjoying the spoils. Every morning. Just like Grandpa said. This morning, I decided it was time for some (vegan) blueberry muffins. And I made these happy accidents from Bakerita. Often with vegan baking, you see eggs replaced with applesauce. This is delicious, but I love the use of bananas in this one and something different! And who doesn’t like the taste of blueberries and banana together! I didn’t have whole wheat flour, so I just made it all with white flour. They aren’t healthier this way, but I do think it made them fluffier! 1. Preheat oven to 400F. Grease a muffin tin with plant butter. 2. Mix all dry ingredients together (flour, sugars, salt, baking powder). 3. In a separate bowl, combine all wet ingredients (oil, banana, almond milk). 4. Add wet ingredients to dry ingredients and combine well. Fold in blueberries! Bakers note: I actually used frozen blueberries straight out of the freezer and they worked perfectly! Serve warm with a hot cup of coffee! 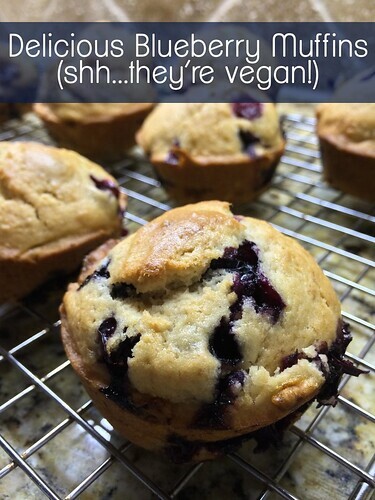 Don’t tell anyone, and they will never know they are eating vegan blueberry muffins!